Feel free to post here some screenshots, videos or just describe what you are currently working on! 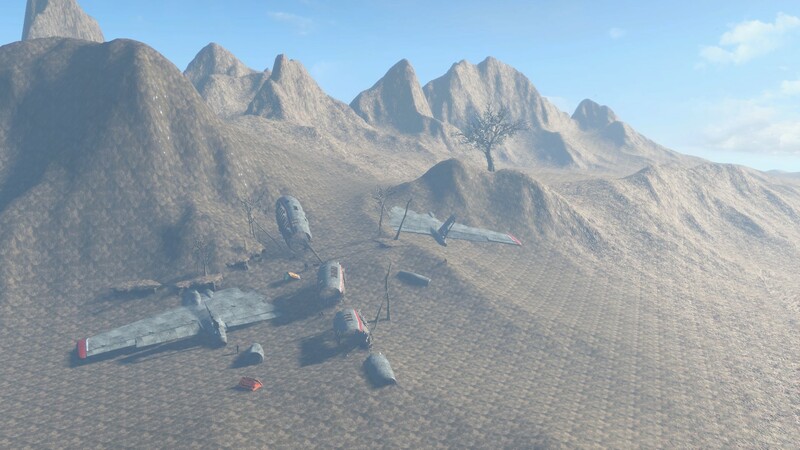 Working on a random crash site, just for fun and practice! Modelling a few concepts right now to get a decent amount of meshes. Will post more as they become more refined. Dude, wow! 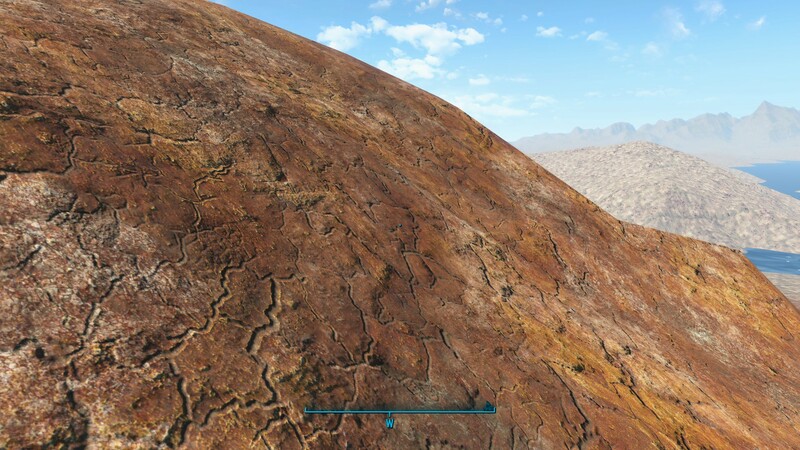 just wow, i can't believe you already started working on the rocks! You're amazing! Tomorrow i am gonna send you some pics from the skyrim creation kit so you can get a look at the mountain pieces that we will need. 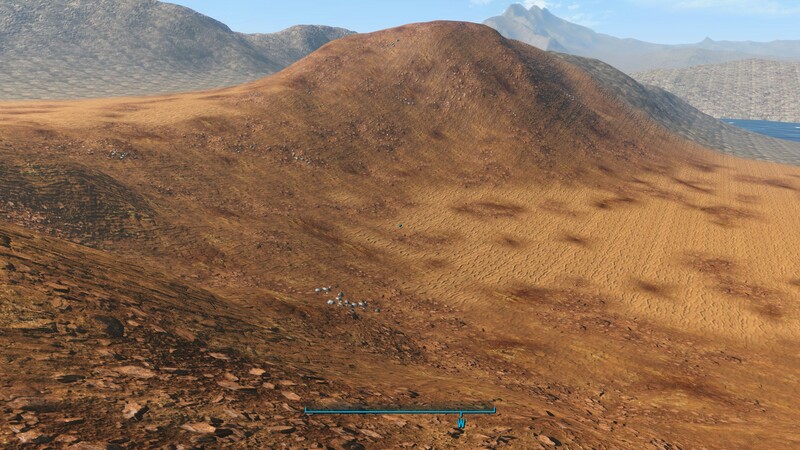 I don't mean to pressure you or anything (since we're not in any rush) but have you had any progress with the Khan tents? Ps: I subscribed to your channel, you got some really cool 3d models in there! Just checked the embedded video and the quality on it is awful! haha give it an hour to do its stuff and it should look neater. Yeah mate just send me them and I'll do my thing. 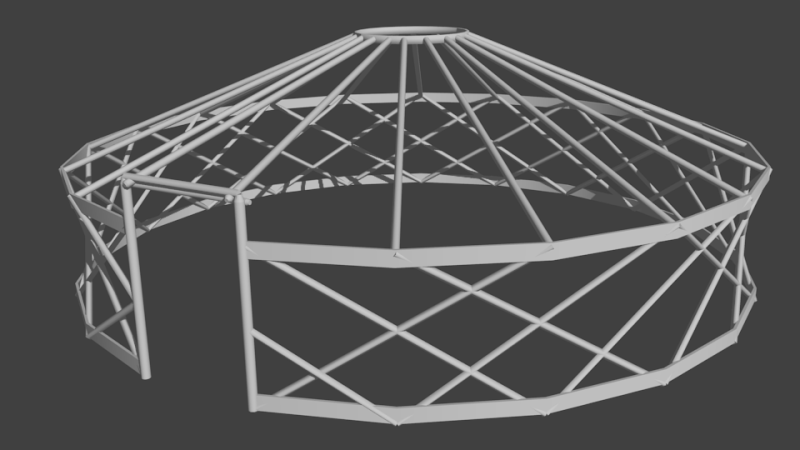 Regarding the tents I had a basic frame modeled out but took a huff with it as it was going wrong in places normal wise and faces etc. 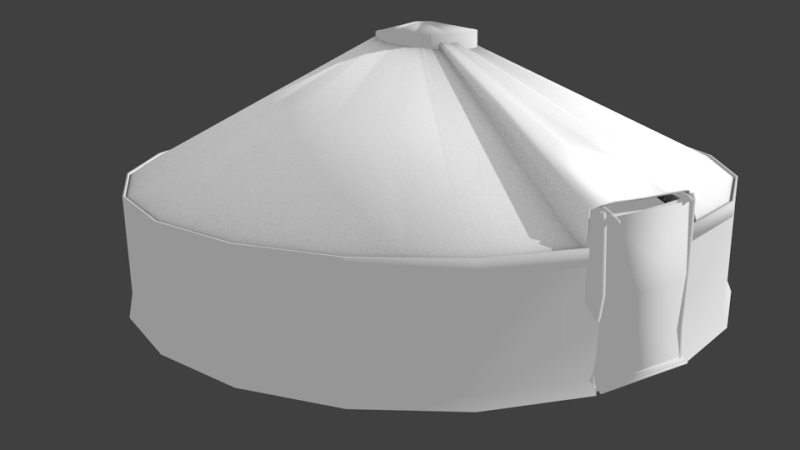 So i've scrapped it and going to go back and really study the making of the tents etc so I've got a clear picture. Oh dear I always hate when people talk about the videos on there. I mainly use it as a sketchbook basically and post everything lol. Oh my horse ! this is just ... just amazing ! Also fooling around in the ck by making a bunker. 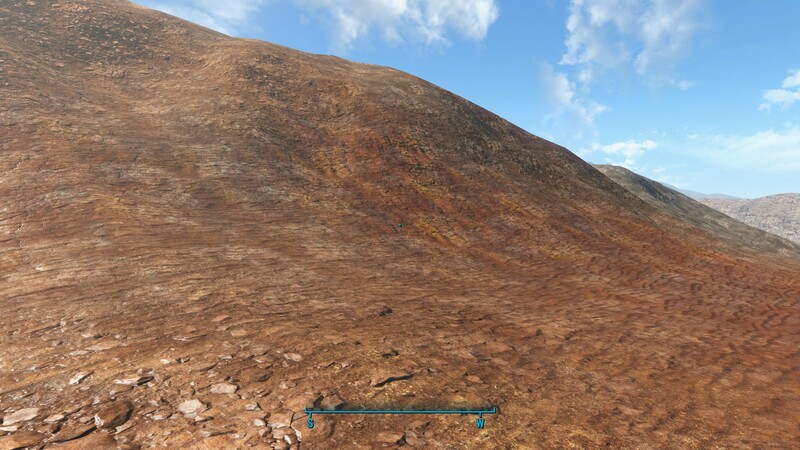 They really changed a lot the building system. 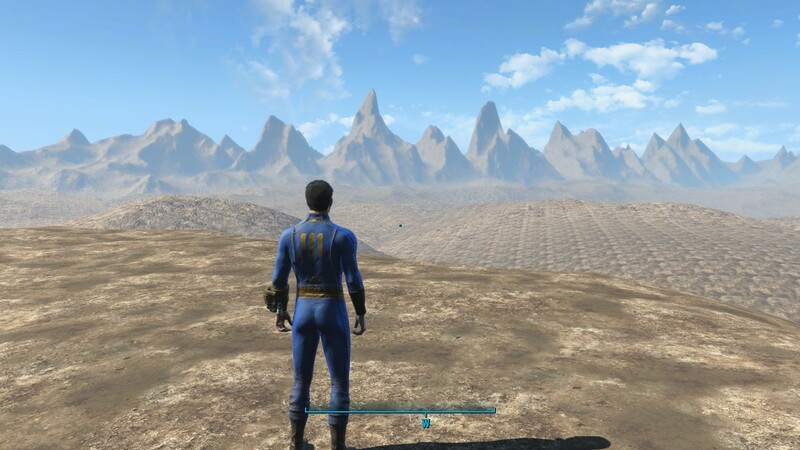 In skyrim and their previous games, exterior buildings used to be one piece each. Now there's kits of building pieces and you can make buildings in many different ways as the system is very modular. That's a very welcome change! @falkbeard wrote: Just checked the embedded video and the quality on it is awful! haha give it an hour to do its stuff and it should look neater. Alright mate, no worries! Take all the time you need, i am sure that you're gonna make them awesome (also remember that you're free to take artistic liberties, they don't have to be exact copies)! That's also a very good looking model, i am sure we can use that somewhere in the mod! 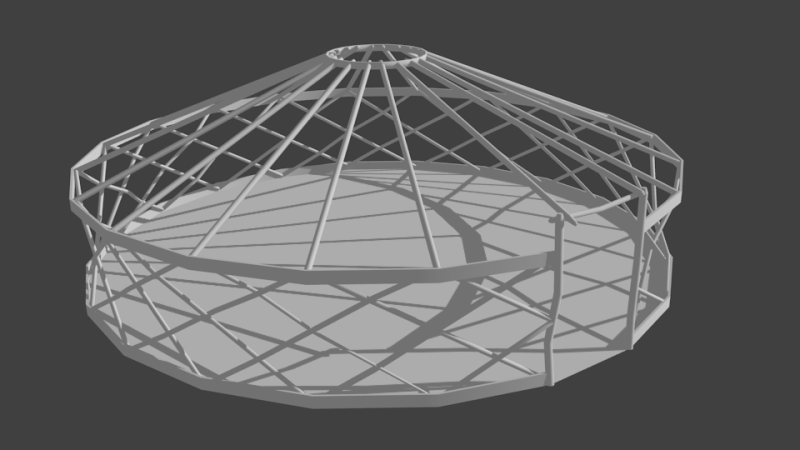 Some progress shots of the Yurt, Will then be exporting it to a software for some cloth simulations etc. Stunning! Really good job Falkbeard, can't wait to see how it will look ingame! Should have mentioned, the first is before alterations and the second is the finished frame. 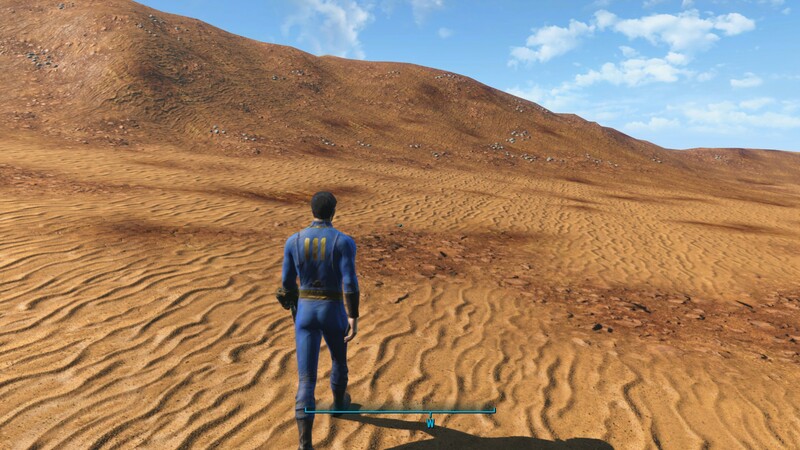 Although I don't know if its a little too high poly for the mod. Can you tell how much Vertices etc a mesh has in the CK? @falkbeard wrote: Should have mentioned, the first is before alterations and the second is the finished frame. 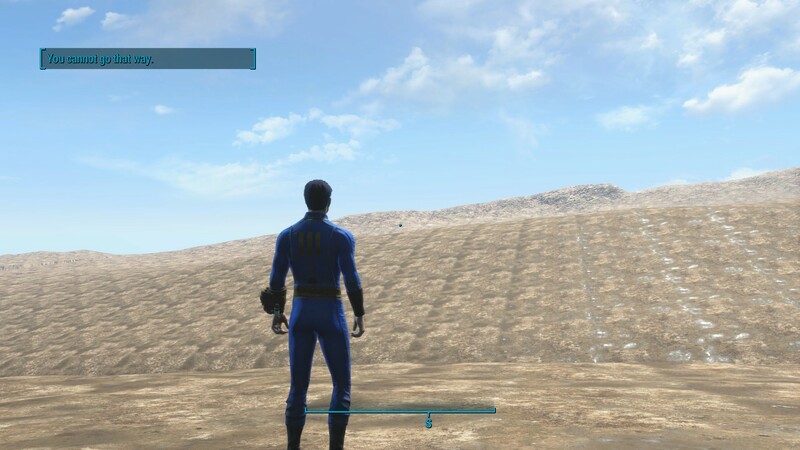 Although I don't know if its a little too high poly for the mod. Can you tell how much Vertices etc a mesh has in the CK? I've never dabbled with 3d modeling so i am not sure about the poly count. 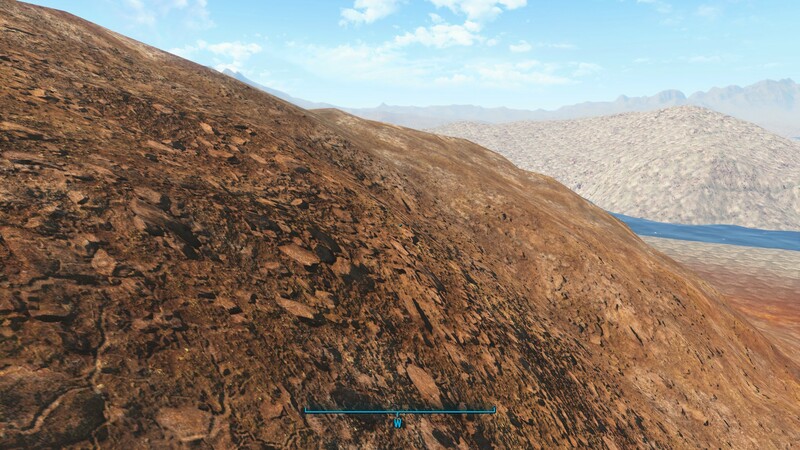 According to this thread for skyrim, they mention that you should never go above 25.000. I'd suggest skimming through that thread yourself in order to figure what's the best number as i am not equipped with the knowledge to accurately say. This thread also has the poly count of various skyrim models but nothing in regards to architecture, it's worth a look though. Sorry, i couldn't be of any more help! Alright so I've checked these links (thanks a ton btw!) and a few others and it seems (in Skyrims case anyway) that the largest models are around 50-60,000 now there is no way in hell I will be nearing that with any of the models but I now know my buffer. Weapons like the gatling laser contain around 10,000 tris. Could not find a lot on Buildings but I assume they will be under the same constraints. 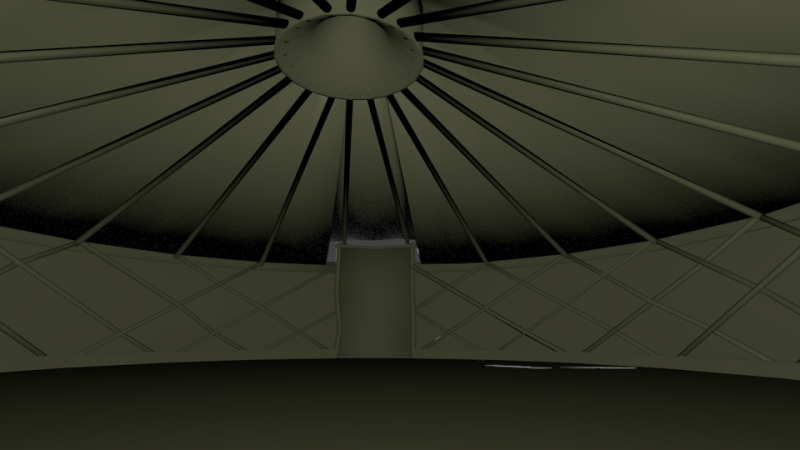 As it stands my model is sitting at 6,000+ tris without any of the cloth and the rope bindings. I'll be considering making 3 versions of each model then 1 to be loaded at a minimum distance of say 100m, 2 to be loaded at 25m and another one for interior cells. I assume each interior cell is now allowed thousands of tris in the scene as there is no worldmap etc to load so I am under no constraints there other than keep it below 150-200,00 tris. My guess after I have tried a few strategies on the cloth is the model will be sitting at around 10,000 tris which I can get down maybe half that without losing too much detail. Atlas can you tell me if the importer for getting models into the CK is nifskope? If so, there is a limit the importer can handle and that is 66,969 tris. Once we have the lore and concept worked out for most of the objects landmarks etc I'm going to sit down and compile a list of every object in the game etc that needs to be modeled instead of the vanilla stuff and I'll be categorizing it by estimated tris count and priority. From what i have been reading from tutorials around the internet, i think that the importer is nifskope. At least all of the tutorials that i can find, make mention of it. I will make sure to study the tutorials religiously over the next days. Cloth simulation #2 looks promising. it's nearly 11pm here and I'm going to call it a day soon. Quite happy with the progress on this today! 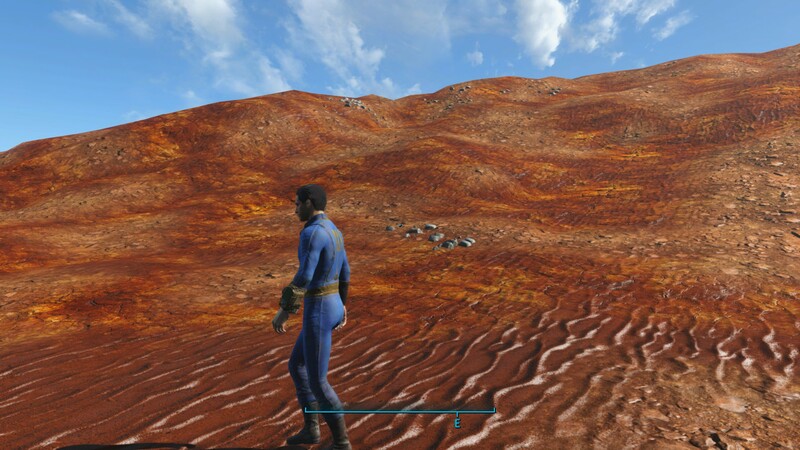 Wow man, its looking absolutely great! Really good job! No pictures yet, but i made some drastic changes to the map (added rivers & lakes) by hand as i was unhappy with their lack from the map. 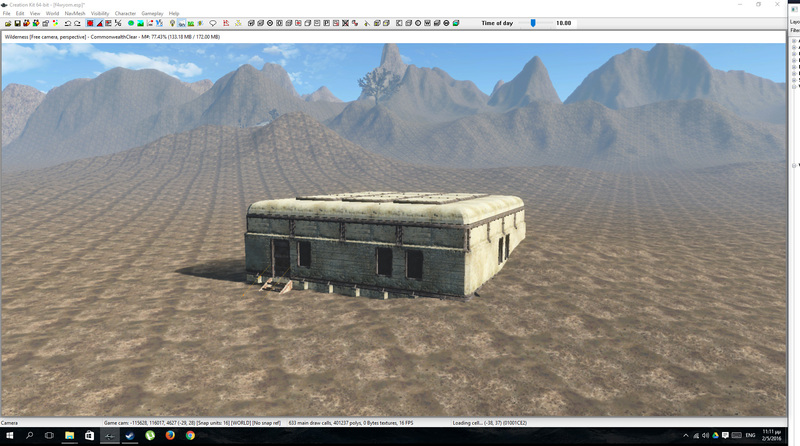 I've been generating lod for the past 6 hours and it's still not finished (yes, it actually takes that long). I'll post some screenshots later if everything turns out alright! After two exhausting days of crashes and troubles, i finally made it! 3. 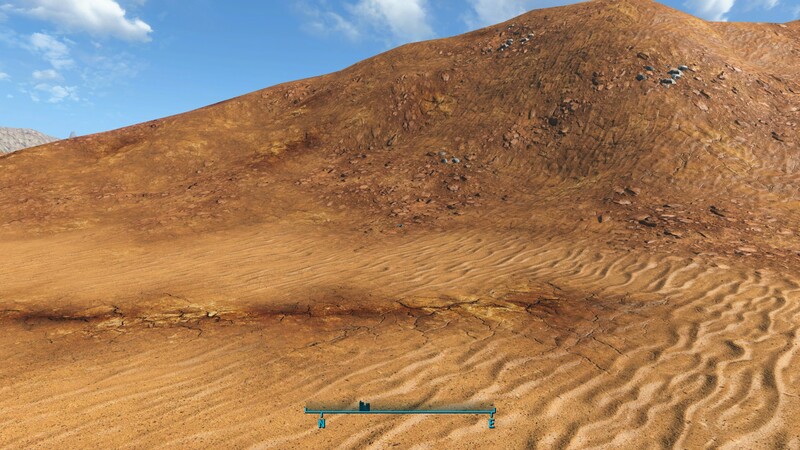 Found out how to import custom land textures and how to fix them from being extremely shiny. 4. 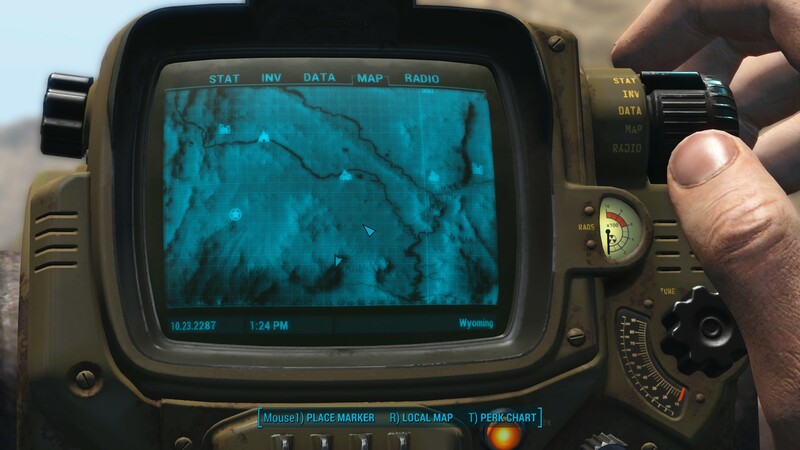 Changed the Map in the Pip-Boy. 5. 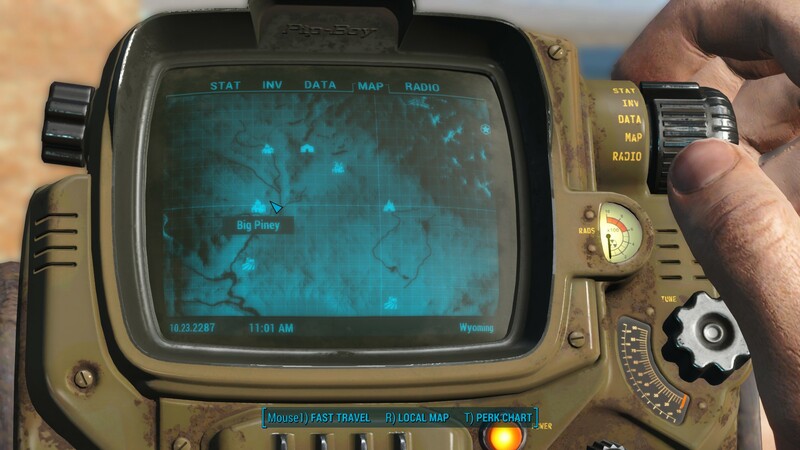 Added a ton of locations on the map (map markers only). 6. 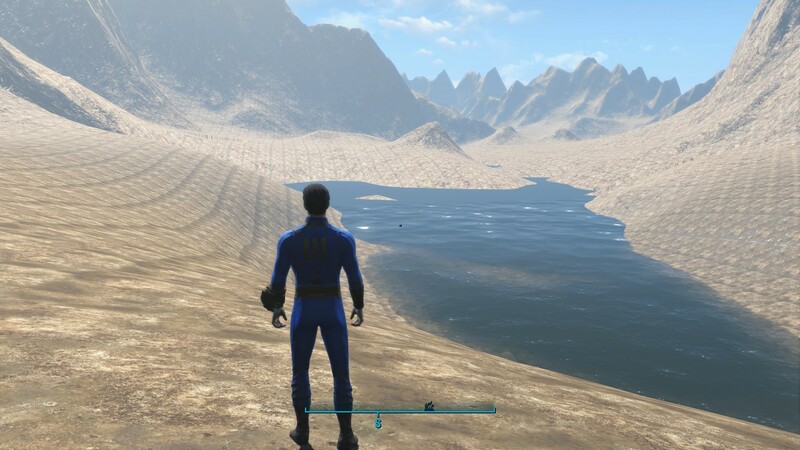 Experimented a bit with the region generation tool, which allows to spawn textures/objects automatically for certain areas and thus landscape them really quick. Unfortunately, whilst i made some progress on learning how to use this tool, it got completely broken and is now unusable for me. This is a major setback and fixing it is my main concern atm. 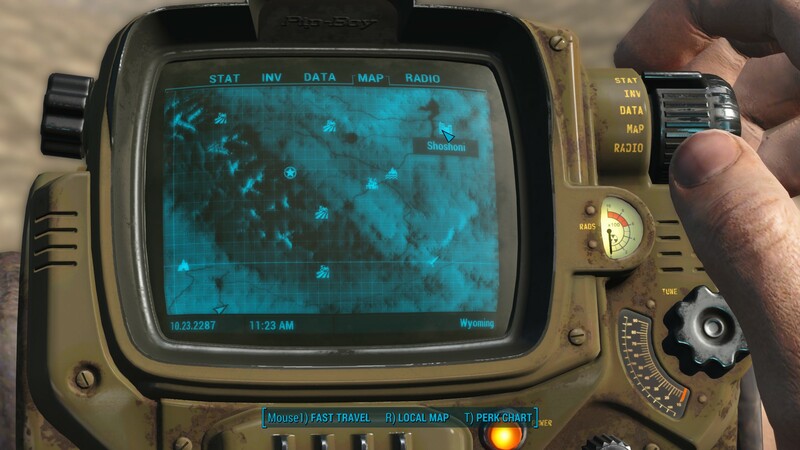 That map in the pip boy is looking awesome! 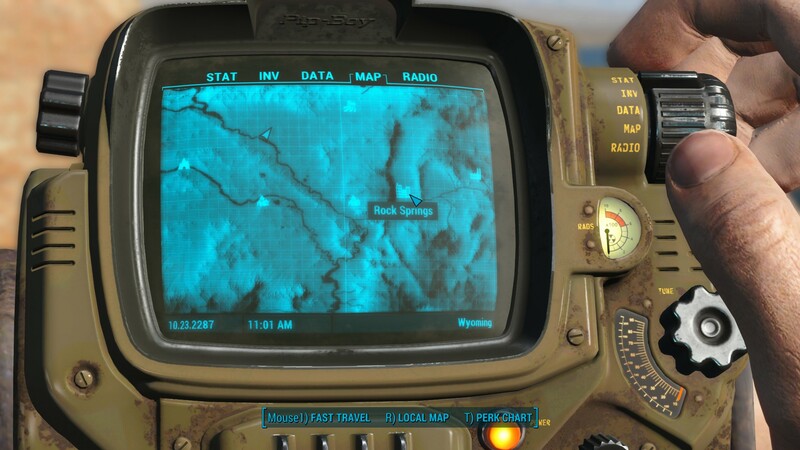 @falkbeard wrote: That map in the pip boy is looking awesome! Today i had more progress, small but progress nonetheless. 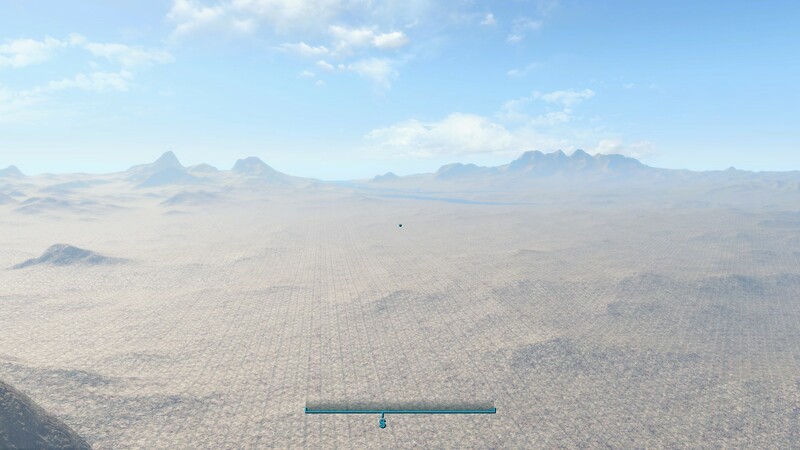 Meaning that when the player reaches an area near the edges of the worldspace, they will not be able to proceed. 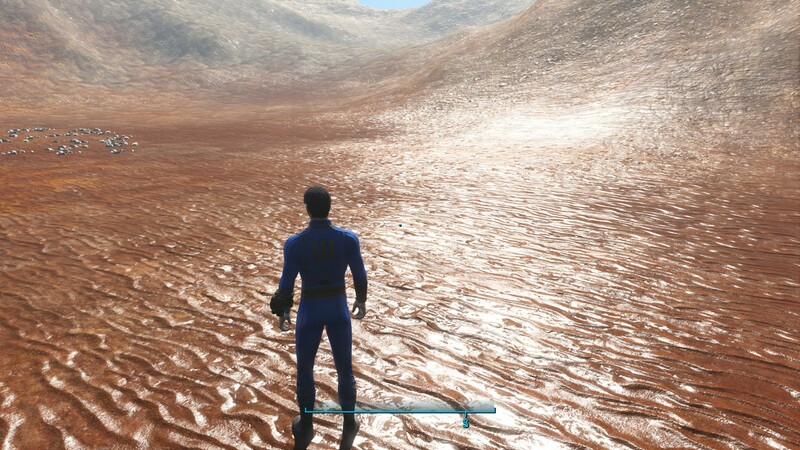 Don't mind the red texture, its just a way to estimate where i will place roads! 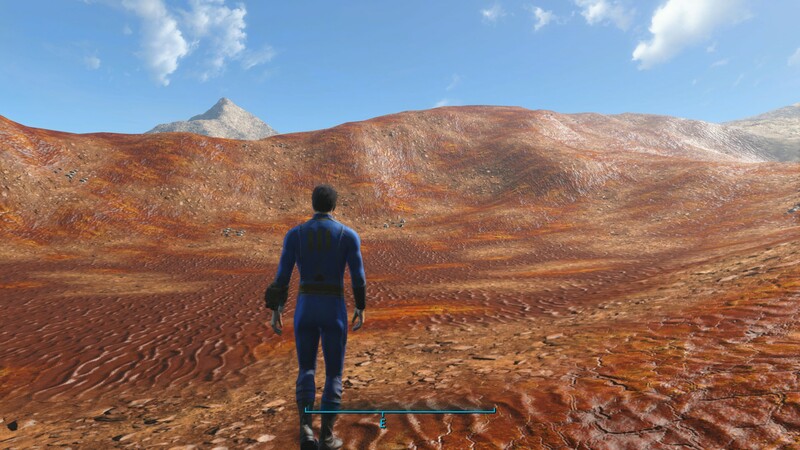 I decided that it would be a good idea to edit some of the vanilla textures so that they fit the needs of our worldspace. 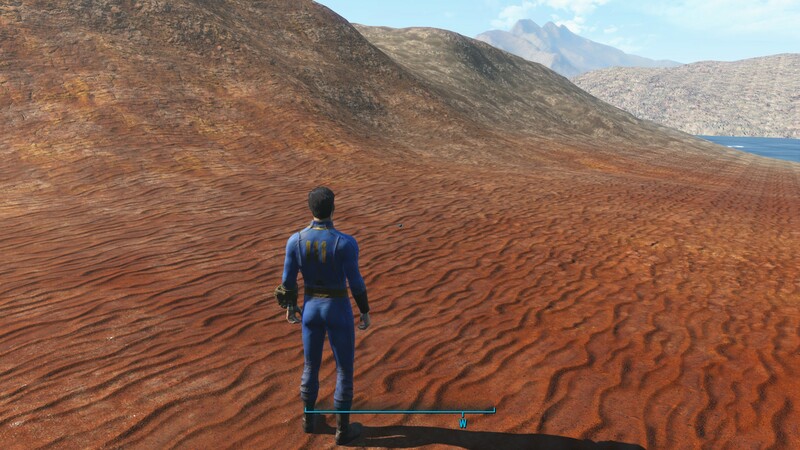 The rocky sand is very nice but the arid ground and desert sand look far too strong. 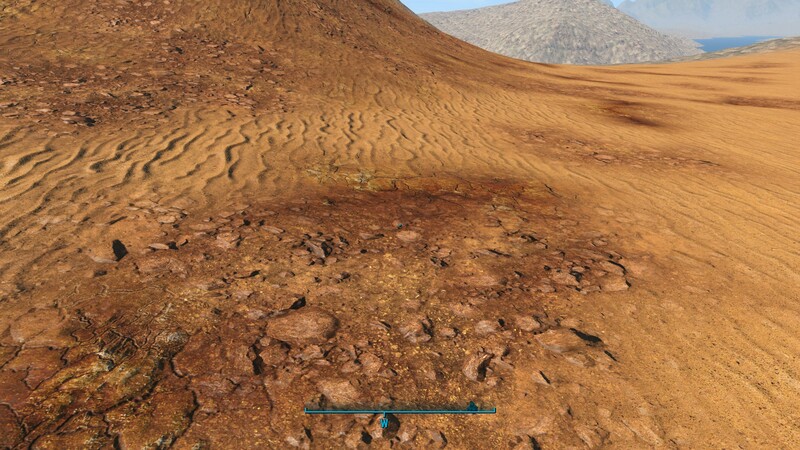 Maybe we could import custom created textures? 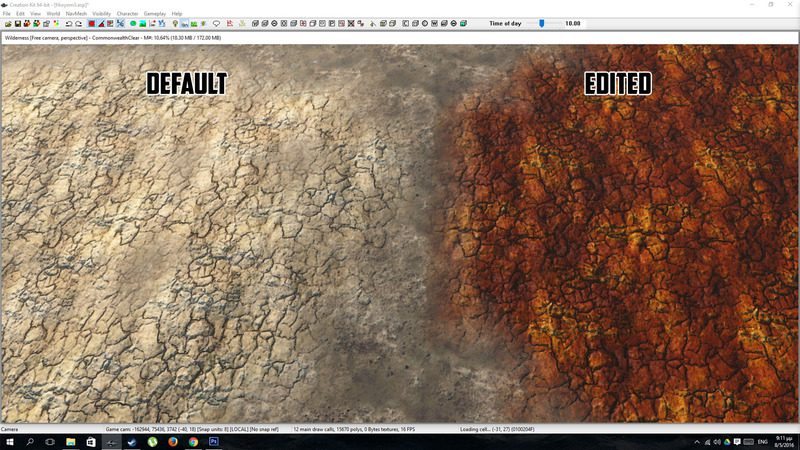 I could make a texture where it is red and rock in the deep cracks but more discoloured and bright where the sun hits. 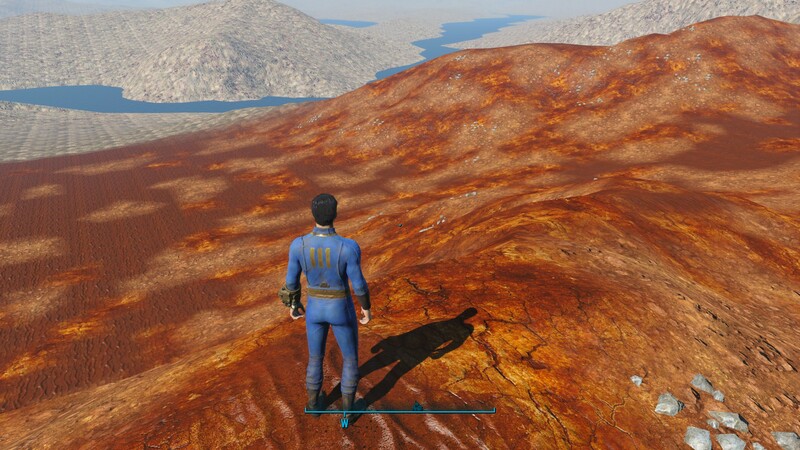 How are we going to proceed with the mountain textures etc? 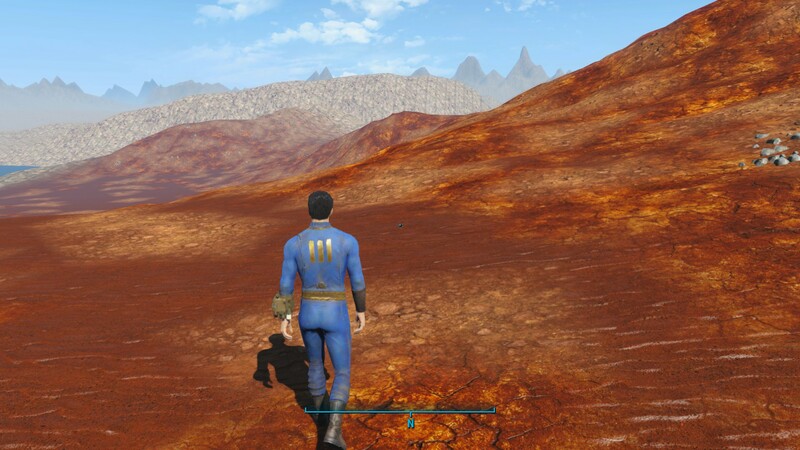 Btw i have received your message atlas and ive got some news which will likely mean i wont be able to do anything on my computer for the next week or two . 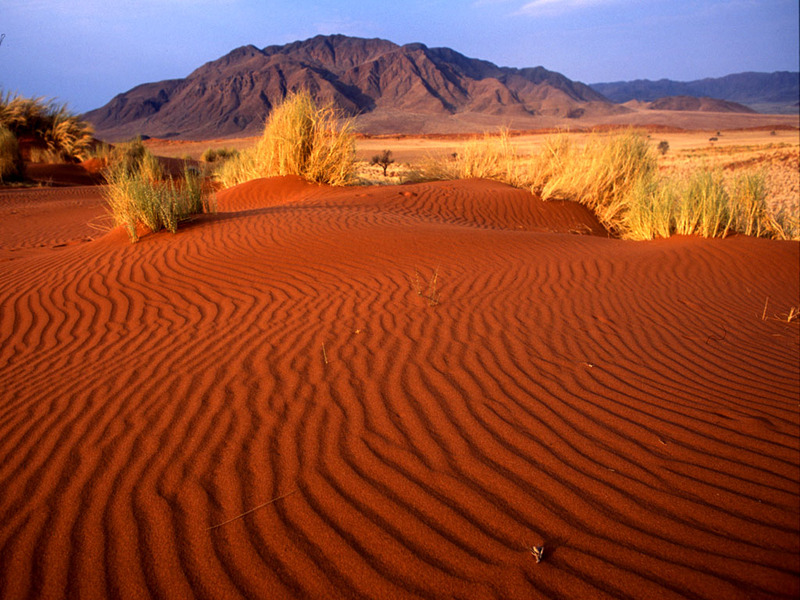 @falkbeard wrote: The rocky sand is very nice but the arid ground and desert sand look far too strong. 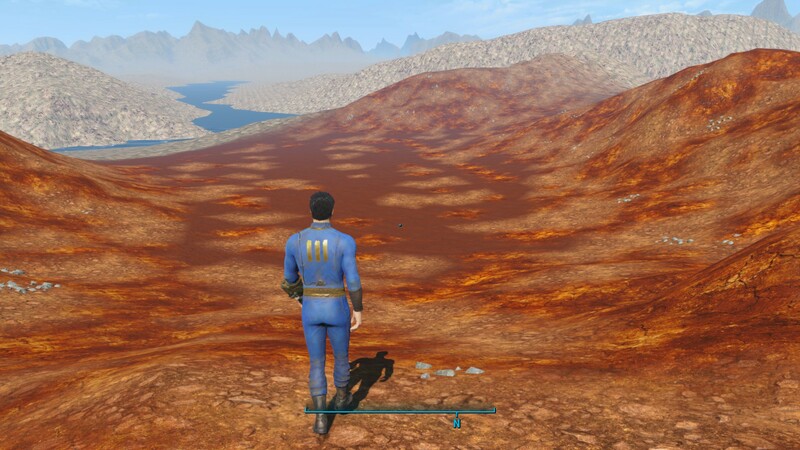 We can definitely make new textures but i don't see the reason to, since i believe that by recoloring the vanilla ones, we retain visual parity (and perhaps make it easier to upload the mod later on for console users etc) as well as reducing effort and task load. This is the first iteration of the textures, so yeah they're not perfect i am gonna keep messing around until i reach a satisfactory point. 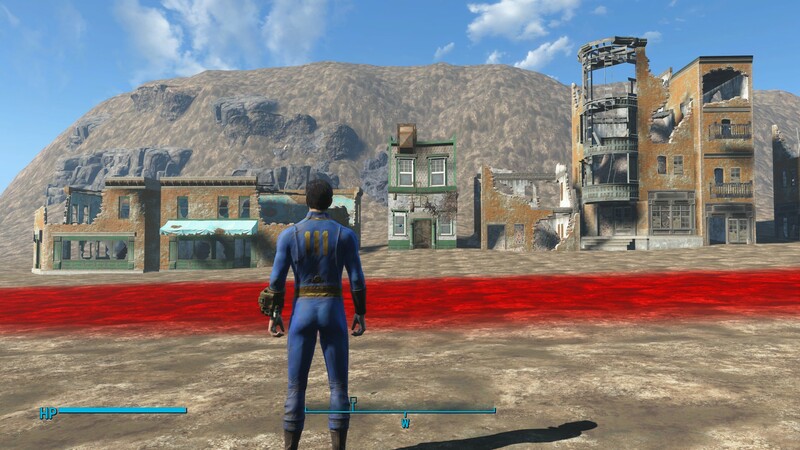 However, keep in mind that within the CK i can control their opacity when applying them to the ground so they won't necessarily look so strong (what you saw in the screens was 100% opacity). 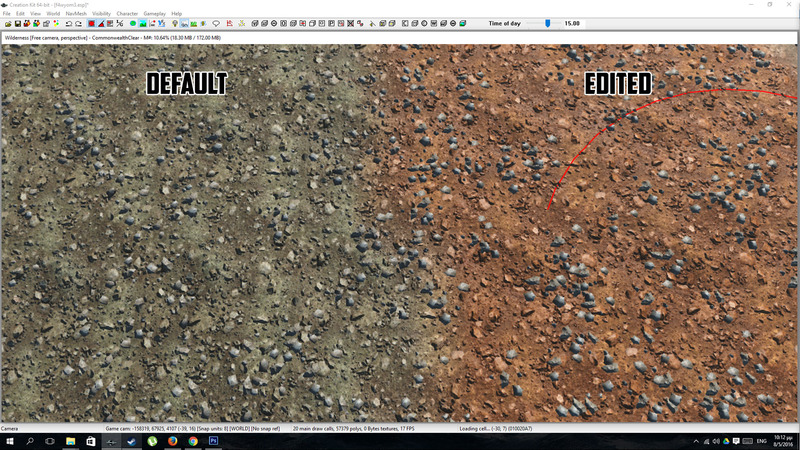 I am working on a small area right now as a test, to see how it's gonna turn out with these textures. Will post my progress here later. Editing this post in order not to spam the thread with my posts. I think that overall, it looks better than i expected it would. There's still a lot of work to be done but feel free to let me know what you think. Kinda messy and not so good looking yet, but this is one of my first attempts with this tool, so this is extremely promising stuff! 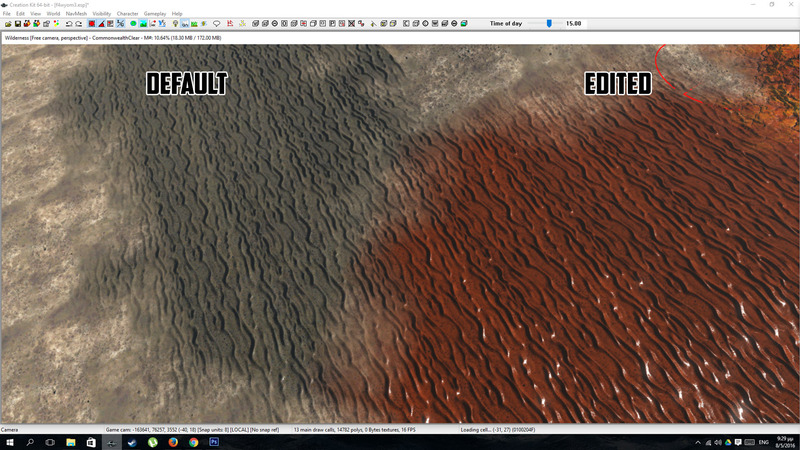 After studying various photographs from Wyoming's Red Desert, i messed a bit more with the texture colors to make them more fitting. It's actually starting to look nice now! Well that's a major change . 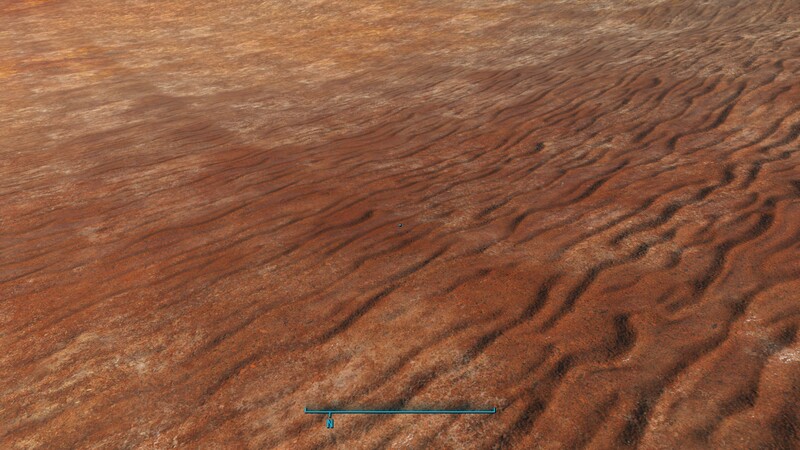 However the sand texture looks a bit ... weird . Looks more like a liquid thing .